Exports of Scotch whisky have increased to many countries over the course of the last decade. But the fastest growing market may surprise you, writes Leon Kuebler for WhiskyInvestDirect. When you think of spirits and Mexico, one word immediately comes to mind: Tequila. This spirit, made from the Agave plant, has been popularised the world over as the drink of Mexico – even if Mezcal, its smokier cousin, is often rumoured to be preferred by locals. Yet within Mexico itself, the last decade has witnessed a sea change in drinking habits, as one spirit above all has gained market share: Scotch whisky. 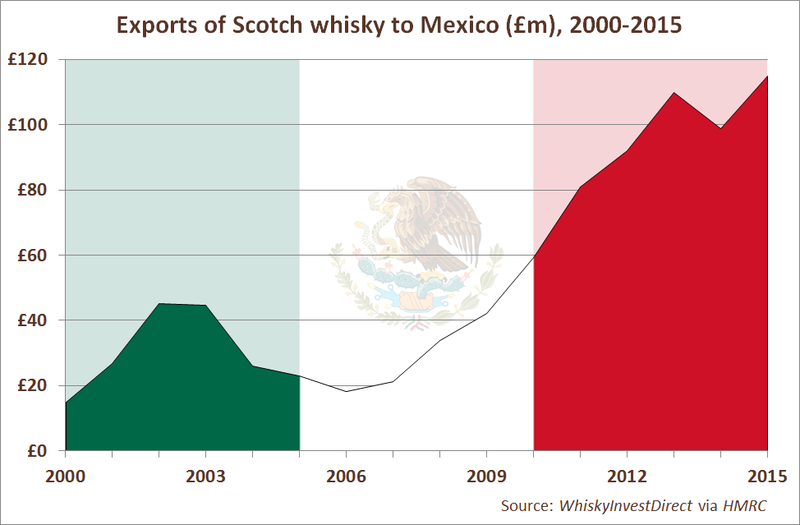 The growth of Scotch whisky exports to Mexico has been nothing shy of phenomenal. Mexico received a total of £115.0m worth of Scotch imports in 2015; an increase of £96.8m, or 535%, from the amount imported in 2006. In 2006, Mexico was the 24th largest market for Scotch whisky in value terms; today, it is the 9th biggest. Likewise, Mexico was the 23rd largest market by volume in 2006; it now ranks 5th in the world in bottles sold. 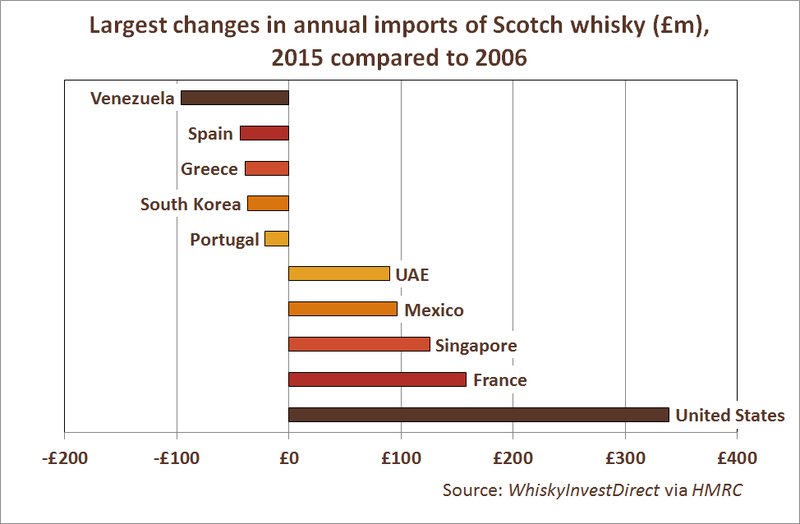 Mexico was certainly not the only country to increase its imports of Scotch over the last decade, but, of the major markets, it was the fastest. In absolute terms, only Singapore, France and the United States have seen imports of Scotch rise more quickly than Mexico; yet those markets, which were building on a far larger base, only experienced single-digit growth. By way of comparison, Mexico saw compound annual growth rates of 20.2% by value and 16.8% by volume respectively. These annual growth rates are not the fastest over the period – that accolade goes to Mozambique. Yet Mozambique imports 1% of the total value of Scotch sent to Mexico, and other markets with larger growth rates are similarly small, if certainly not insignificant, in comparison. The rising popularity of Scotch in Mexico has come at the expense of other spirits. According to figures given by the IWSR, retail sales (including tax) in Mexico of spirits grew by an average of 3.6% per annum by value and 2.5% by volume between 2006 and 2014. This annual growth rate is far below that posted by imports of Scotch whisky over the same period. Thanks to these high growth rates, Scotch whisky has outperformed all other major categories of spirits in both volume and value terms. Tequila is still the national spirit of Mexico in bottles sold, but, in value terms, Scotch whisky (29.1%) now has nearly the same market share as Tequila (32.5%), despite having only a third of the volume sales. The rise of Scotch whisky in Mexico has come at the expense of other imported luxury spirits, such as brandy, rum and vodka, which have all seen their market share decline. Indeed, only Canadian, Irish and American whiskey have experienced faster rates of growth than Scotch over the same period, yet their combined sales for 2014 only amounted to 5.8% of the value for Scotch, despite the geographic proximity of the United States. While Mexico has acquired a taste for both whisky and whiskey, its preference is still clearly for the former. Scotch whisky has been popular in Mexico for some time, but it was historically too expensive for most consumers. In the late 1960s, this led to an abortive attempt by the government to produce its own “Scotch-type” whisky, along with importing cheaper product from Japan. However, as the Mexican economy has managed to sustain steady growth over the last two decades, Scotch has become affordable to many more Mexicans, even if inequality still remains high. Among young adults, Scotch whisky has become the drink of choice, with brands such as Ballantine’s, Chivas Regal and Passport driving strong growth. 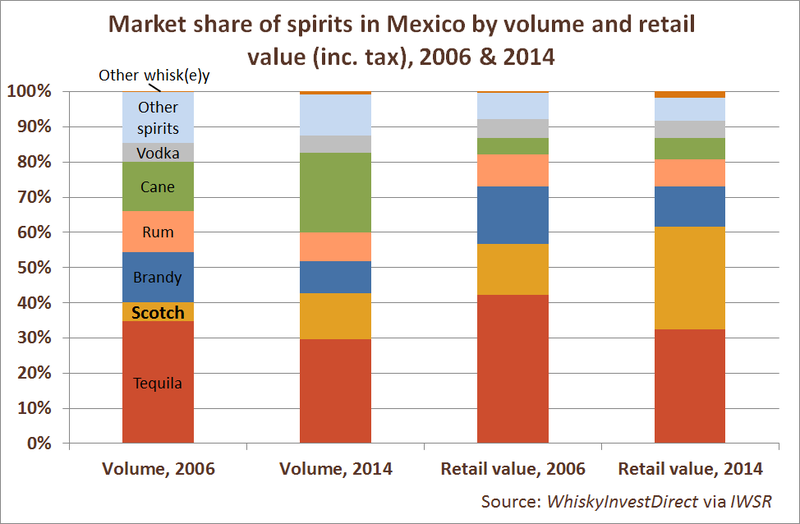 As Diageo’s annual report noted, sales increases in Mexico were driven mainly by ‘growth across all price segments of scotch other than value’. Yet the move towards luxury brands in Mexico is not limited to Scotch. For this reason, Diageo decided in 2014 to acquire Don Julio, the most popular luxury brand of Tequila, from Jose Cuervo. In return for Don Julio, Jose Cuervo, arguably the most famous organisation in Tequila, received Bushmills, the second-largest brand of Irish whiskey in the world – and, crucially, Ireland’s largest producer of malt whisky. As a result, the most important player in the Scotch whisky industry now has a substantial stake in the continued success of Tequila. Yet, even more significantly, the world’s most popular brand of Tequila has placed a bet on malt whiskey’s enduring popularity, both at home and abroad. With or without the ‘e’, in the eyes of Jose Cuervo, it’s in whisky, at least as much as Tequila, where the future seems to lie.